April is National Turn Off Your TV Month, a grassroots event promoting awareness of the negative effects of excessive screen time. Take the challenge to not watch any television for a week or even the rest of the month. American families on average spend 4-5 hours a day watching TV. In fact, 56% of 4-6 year olds cannot read in homes where the television is on most or all of the time. The health of children addicted to television is at risk as well. In 1965 only 5% of children were overweight, but now one in five American children are overweight and half those are severely obese. National Turn-Off Your TV Month is endorsed by over 65 organizations including the American Medical Association, the American Academy of Pediatrics, and the National Education Association. After you decide to unplug the TV for the week, you’ll find yourself with a surplus of spare time. Go outside and play with your friends and family. Then when you want to relax, get comfortable and read some award winning and best-selling eBooks from Lerner Digital’s extensive catalog. The greatest intellects have struggled to comprehend infinity, but for a curious girl like Uma, thinking about the possibilities of this big idea may just be . . . infinite. Looking up into the night sky, Uma felt very small beneath the countless stars. She wonders what infinity is. Is it a number that grows forever? Is it an endless racetrack? Could infinity be in an ice cream cone? Kate Hosford’s beautifully written story pair with Gabi Swiatkowska’s captivating illustrations will earn its place on the shelf as a classic for both kids and adults alike. During your TV free week, should defiantly spend one evening counting the stars and gaze into the infinity of the cosmos. Infinity and Me won a New York Times Best Illustrated Children’s Book award, was named an ALA Notable Children’s Book, and has been praised in the reviews. Are you feeling bored without TV, well don’t give in just yet. Boredom often leads to invention and creativity which is exactly how the game of basketball was created. 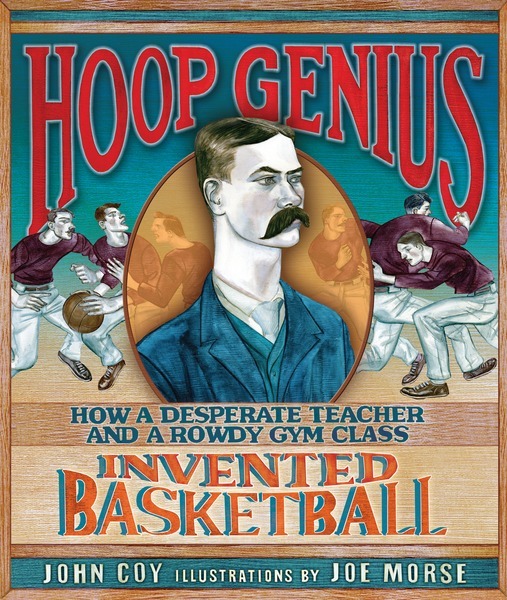 John Coy’s best-selling and winner of 12 awards, Hoop Genius, tells the true origin story of basketball. Taking over a rowdy gym class right before winter vacation is not something James Naismith wants to do at all. The last two teachers of this class quit in frustration. The students—a bunch of energetic young men—are bored with all the regular games and activities. Naismith needs something new, exciting, and fast to keep the class happy—or someone’s going to get hurt. Saving this class is going to take a genius. Discover the true story of how Naismith invented basketball in 1891 at a school in Springfield, Massachusetts. With the weather warming up, you should definitely go shoot some hoops or play a game of H.O.R.S.E. during your TV free week. Television often recycles plots and cliches that fail to strike the imagination. This was not the case when Bill Sommer and Natalie Tilghman teamed up to write their unusual tale. A 52-Hertz Whale is inspired by a real yet mysterious humpback whale that sings at the frequency of 52-hertz. It seems to be the only whale emitting a call at this frequency and hence, has become known as the world’s loneliest whale. In A 52-Hertz Whale, James, a high school freshman, is worried that the young humpback whale he tracks online has separated from its pod. So naturally he emails Darren, the twenty-something would-be filmmaker who volunteered in James’s special education program back in middle school. Predictably, this thread of emails leads to a lot of bizarre stuff, including a yeti suit, drug smuggling, widows, a major documentary film-making opportunity, first love, a graveyard, damaged echolocation, estranged siblings, restraining orders, choke holds, emergency dentistry…and then maybe ends with something like understanding. Doesn’t sound like your run-of-the-mill storytelling, am I right? So whether you’re reading with Lerner Digital, exercising your imagination, or playing outside—you’ll discover turning off the TV is not such a sacrifice. You might even see the value of limiting your TV time in the future.